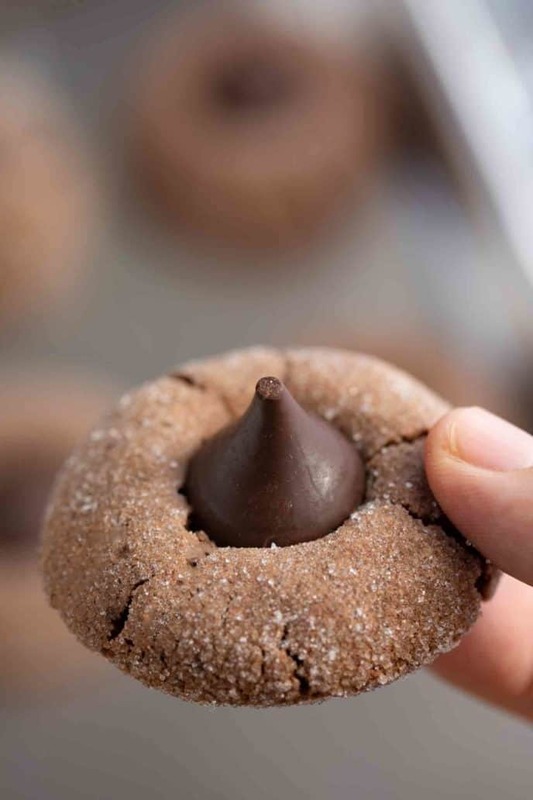 Hershey’s Kiss Cookies are soft and chewy chocolate cookies, made with cocoa powder, melted chocolate and rolled in sugar before baking and topped with Hershey Kisses, ready in under 30 minutes! Cookies are practically a staple around here, and right now we’re baking Chocolate Chip Cookies, Turtle Cookies, and Oreo Balls (Oreo Truffles)! Hershey’s Kiss Cookies are the PERFECT combo of chewy chocolate cookie and Hershey kiss candies. This is one of my all-time favorite cookie recipes. They are made with cocoa powder and melted chocolate, with kisses pressed into the top, which is basically chocolate heaven. Plus they’re totally kid-friendly, because they’ll love helping to press the candies into the cookies! 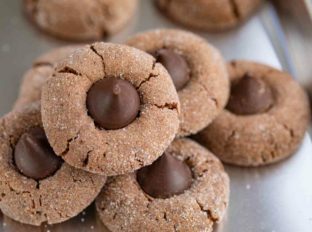 These kiss cookies are like a chocolate version of my favorite Peanut Butter Blossoms, but without the peanut butter. If you’re looking for another chocolate recipe to serve next to these cookies, you’ll love my chocolate truffles! HOW DO YOU STORE HERSHEY KISS COOKIES? Kiss cookies can be kept at room temperature for up to a week, if they don’t get eaten before that. I like to put a piece of parchment paper between each layer, so the cookies don’t stick together. You can also add a piece of bread to absorb any potential moisture in the container, which helps them stay chewy. CAN YOU FREEZE HERSHEY KISS COOKIES? 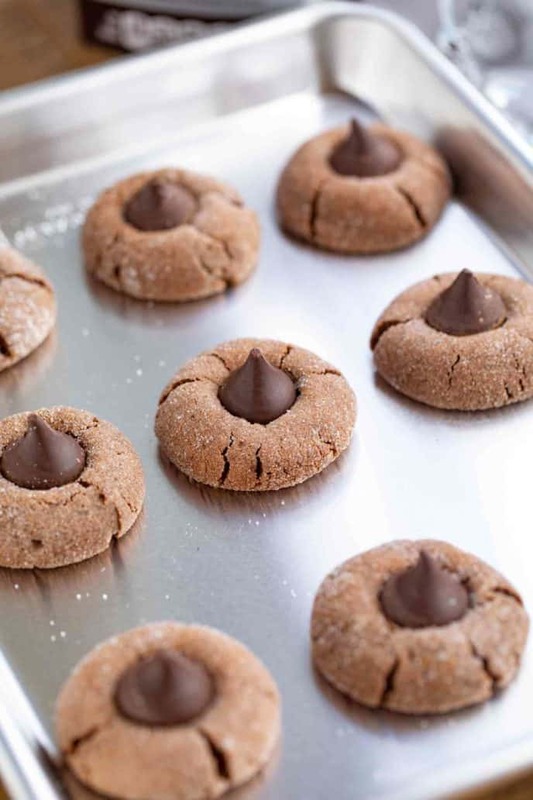 Make your kiss cookies ahead of time and layer them in an airtight container, then freeze. Defrost them at room temperature a few hours before serving. If the kisses don’t stick, you can try to warm just the cookie up and press the kiss into the warm cookie. I usually advise baking cookies from the freezer to warm them up and make them feel just baked, but with kiss cookies the Hershey kiss will melt in the oven, so I don’t recommend it. If your cookies are crumbly, it’s usually because they’re either over-baked or there’s too much flour being added. Make sure to measure the all purpose flour exactly, leveling the measuring cup or using a scale. This is a good practice with all of the dry ingredients when you’re baking. 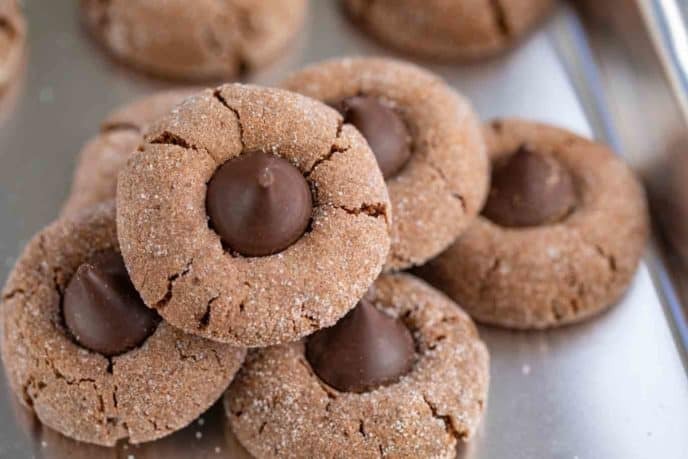 You can use flavored Hershey kisses for these chocolate cookies. I’ve made these with the almond, caramel-filled, and white chocolate versions before, and they all turned out great! Try other toppings instead of the kisses, like chocolate chips or chocolate mints, caramel, marshmallows, or peanut butter. 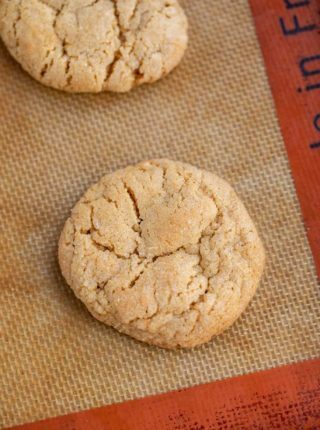 This recipe uses both white granulated sugar and brown sugar, which helps keep the cookie chewy. But if you only have white granulated sugar, you can replace the brown sugar with that. 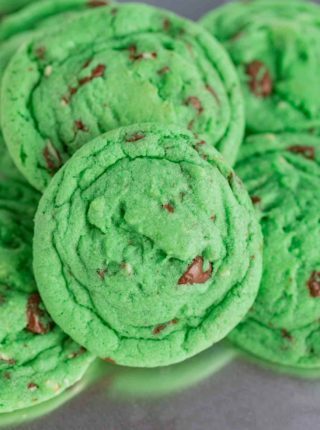 Try using peppermint chocolate and crushed peppermint candies for a holiday version! Be careful not to crowd the cookies on the cookie sheet, so the cookies have room to drop and don’t stick together. Line your cookie sheet with parchment paper to help keep the cookies from sticking, and also to help with cleanup when you’re done! Hershey Kiss Cookies are soft and chewy, made with cocoa powder, melted chocolate, and topped with Hershey Kisses, ready in under 30 minutes! Preheat oven to 350 degrees and add the butter and sugar to a stand mixer with the beater attachment on medium speed until lightened in color and fluffy, about two minutes. Add in the vanilla, egg and finally the melted chocolate. Sift together the flour, cocoa powder, baking powder and salt and add it into the stand mixer on low speed until just combined. Scoop with a 1 tablespoon measure into a bowl of sugar and roll in the sugar (try not to touch the dough too much) then place on a baking sheet (I do this in 3 sheets of 10 cookies each) and bake for 8-10 minutes. 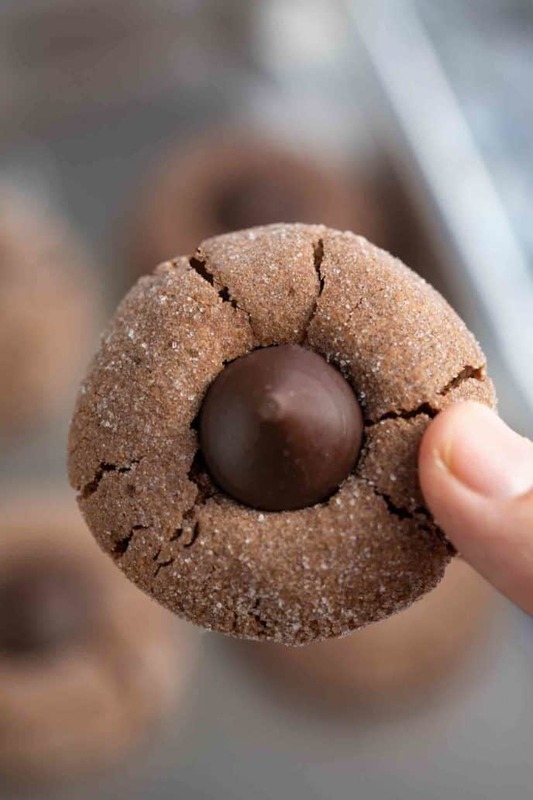 Once you remove from the oven have the chocolate kisses unwrapped and ready to push into the center of each cookie immediately then remove from the pan to cool completely. These are really great treats!! My kids won’t stop eating these! Haha! So glad they enjoyed them. 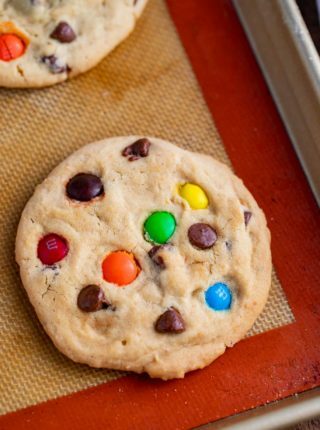 I could eat a dozen of these cookies! They are so delicious! I am loving how chocolaty these cookies look. Perfect for a treat! 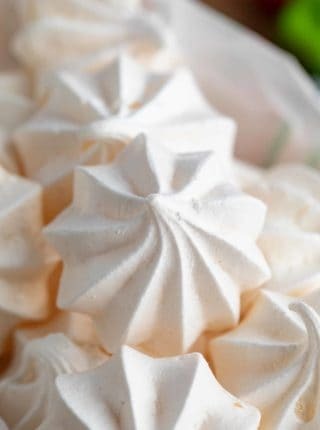 Definitely will satisfy a sweet tooth! My kids ate these up so quickly that I’m making another batch as we speak! Winner for sure! Yay! So glad you all enjoyed them!